Chinese New Year 2018 is under the Dog sign which is said to be very prosperous and successful in terms of Education. The Northfield community gathered on Tuesday the 20th to celebrate and therefore, they have put together a real treat for everyone. Thanks to Mrs Canakiah-Shiboo who organized the show. The ceremony started with our 2 very poised MC, Julie of year 7 and Adam Sall in Year 12. Then the event followed with our lovely year 6 girls Annabelle, Celine, Isabella, Mila and Taylor with a ribbon dance. Following that, our special warriors namely Alex, Jacques, Rehan and Senthil from Year 6 gave us a nice kung fu demonstration. We were mesmerized by Max from year 5 and Julie year 7 and their beautiful Chinese song. As usual Mrs Canakiah always try to bring an element of surprise and this was the year 12 lead by Sophia Robens to performed an umbrella dance. 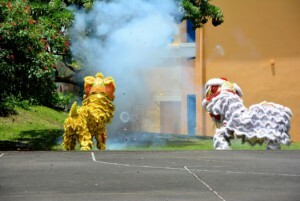 Lastly, the famous “LOULOU DRAGON” came to the school and concluded our celebration. All in all, everyone enjoy the show and followed the dragon around the school.